As squirrels have large litters, the depiction of a squirrel with trailing vines may be a visual rebus for a wish for many sons and the continuation of the family line, the winding vines representing the family lineage. It has also been suggested that the squirrel and grape-vine motif conveys a wish for promotion to a higher rank. This bottle is probably from the second half of the Qianlong period, still echoing the bold, substantial, well-rounded carving of the earlier eighteenth century Palace workshops. 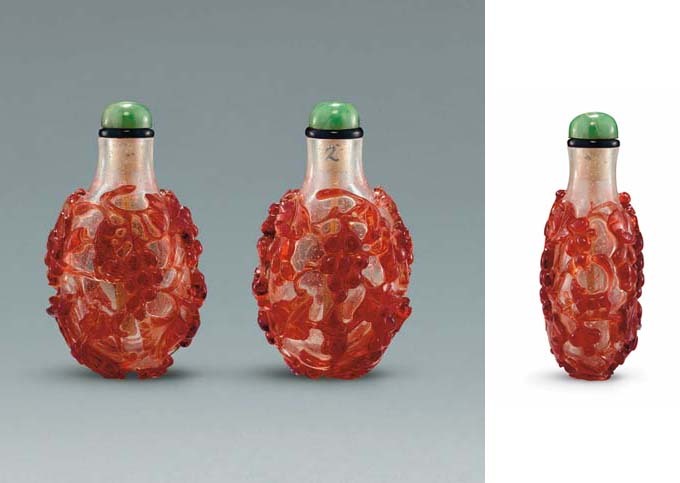 For a later red overlay white glass snuff bottle with similar subject, see Sotheby's, Hong Kong, 28 October 1992, lot 326.